Monday, July 9, 2018. Master of Government Affairs and Administration (MGAA) UMY received a visit from the Department of Government Studies Muhammadiyah University of Makassar in Amphitheater, Postgraduate Building 4th Floor. 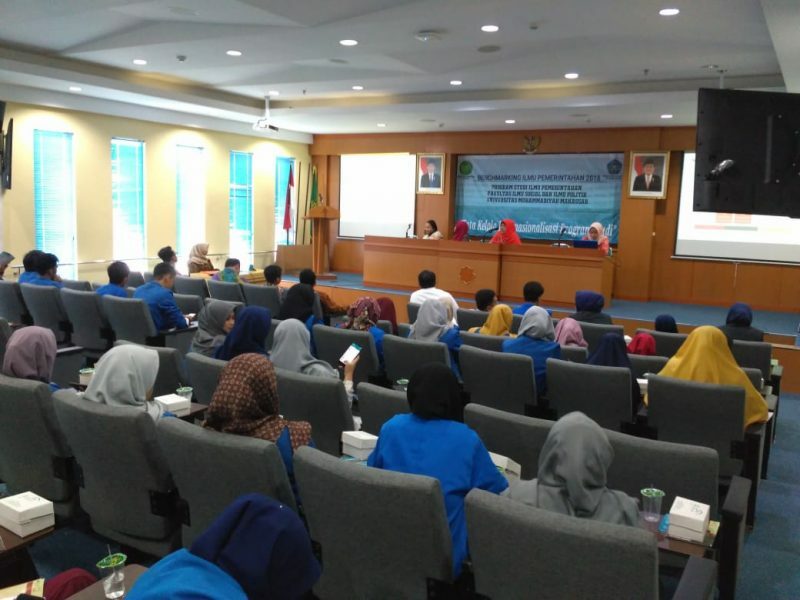 This event was attended by 70 Students and 8 Lecturers lead by Andi Luhur Prianto, S.IP. , M.Si. as Head of Department of Administration of Muhammadiyah University of Makassar to conduct comparative study in management of International Program of Government Affairs and Administration (I-GOV) and Master Program of Government Affairs and Administration (MGAA) as well as socialization of advanced study of MGAA UMY. Secretary of MGAA-UMY, Erni Zuhriyati, S.IP., MA has the opportunity to introduce MGAA-UMY, about accreditation status, brief profile, lecturer profile, and cooperation with national and international institutions. Erni Zuhriyati asserted that MGAA has received A accreditation from BAN-PT and APSPA (Asia Pacific Society for Public Affairs) and received some foreigner students. A total of 70 students with 8 lecturers and led by Andi Luhur Prianto, S.IP., M. Si. as Head of Department of Administration of Muhammadiyah University of Makassar to conduct comparative study of governance of International Class Program of Governmental Science (I-GOV) and Master Program of Governmental Science as well as socialization of advanced study of Master of Governmental Science of UMY. Secretary of Masters Program of UMY Sciences, Erni Zuhriyati, S.IP., MA has the opportunity to introduce Master of Science program of UMY Government, about accreditation status, brief profile, lecturer profile, university institution cooperation in foreign and overseas. Erni Zuhriyati asserted that MIP has received A accreditation from BAN-PT and APSPA (Asia Pacific Society for Public Affairs) and received some Master students from outside Indonesia.